President Donald Trump’s non-stop flight from Riyadh to Tel Aviv is being described as the first ever non-stop flight between Saudi Arabia and Israel. That the Saudis allowed this direct flight, usually banned, reflects the fact that the relationship between Israel and Saudi Arabia, like that of Israel with a number of Gulf states, has been quietly but perceptibly thawing in recent years. This thaw reflects the growing convergence between Israel and the Sunni states of the Arab world, all who share a view that Iran is the biggest threat to their security and regional stability. Matching that convergence was the message conveyed by President Trump, first in Saudi Arabia and then in Israel, of a geo-strategic shift in U.S. policy. It was just one year ago that then-President Obama, seeking a modus vivendi with Tehran, said that America’s Gulf allies need to “share the Middle East” with the Iranians. That view of the Middle East was decisively repudiated this week, with Trump clearly aligning the United States with the majority of the Sunni Arab world, and Israel, against Iran. Yet despite this shift and some hints of an improved tone, President Trump carried no explicit public message of peace from Riyadh to Tel Aviv on Air Force One. Nor did he explain—either in Riyadh, or in Israel—the specific possibilities for peace between Israel and the larger Arab world. Instead, President Trump focused on Palestinian President Abbas and Israeli Prime Minister Netanyahu as the committed partners for peace, adding only that the Arab world would like to see the two leaders reach a bilateral agreement. Without integrating the leaders of the Arab states he just met in Riyadh into a new framework for Israeli-Palestinian negotiations, President Trump is unlikely to achieve the peace he seeks. The Arab states have a crucial role to play, both in incentivizing the Israelis to make sacrifices for peace, and in supporting the Palestinians in concluding a conflict-ending agreement with Israel. 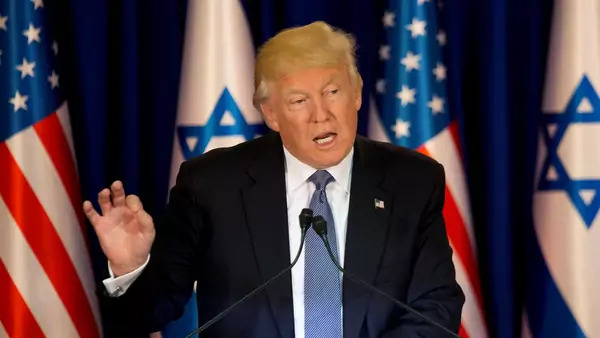 Perhaps most striking was President Trump’s choice not to mention the Arab Peace Initiative (API), which Israel and the Arab states agree can serve as a basis for a comprehensive approach. While the API, when proposed by Saudi Arabia in 2002, originally offered peace between Israel and the Arab world after a complete Israeli withdrawal to boundaries existing prior to the 1967 Six Day War, the proposal has since been modified by the Arab states to make it more palatable to Israel. For several years now, the Arab states have suggested that the plan can serve as a basis for negotiations, and that progress toward Israeli-Palestinian peace can be met with parallel progress toward peace between Israel and other Arab states. Recognizing these changes, Netanyahu last year broke over a decade of official Israeli silence and spoke positively at the Knesset of the API. Perhaps in the weeks and months ahead, President Trump will seek to exploit the regional goodwill he hinted at and which exists to facilitate Israeli-Palestinian peace. Other than the new Middle East regional environment, there is little to suggest that myriad obstacles that have prevented a bilateral peace agreement between Israeli Prime Minister Netanyahu and Palestinian President Abbas before can now be overcome, particularly pursued the same tried and tested way through direct bilateral negotiations. Unless President Trump adopts a new approach—one that integrates the Arab states as active participants in support of a deal, not as bystanders to another round of Israeli-Palestinian negotiations—there is scant reason to believe the new U.S. president will have any greater success in brokering a peace deal between these two Middle Eastern leaders than did the previous administration.